Back again Yes there's movement at the station once again finally. I'm moving Laputan Logic over to a new completely dog-food-compliant website which is located at www.laputanlogic.com. All updates will occur there for now on, so please update your bookmarks and if you have one of those websites that is kind enough to link to me, please update your blogroll as well. I must say I'm pretty happy with the new format which I hope will enable me to update more frequently but at the same time keep the stuff I have spent more time working on from being pushed too far down the page. I must confess I have been struggling to find the right mix with the blog format. I think this should be a major improvement and I hope you will like it as well. In 550 AD, during the reign of Emperor Justinian, a monk who was cloistered at a remote monastery in the Sinai desert wrote a curious book about the topology of the earth and the universe. In the book the monk, who is know to posterity as Cosmas Indicopleustes, propounded a surprising theory that the world was not spherical as believed by the ancients but, on the contrary, was flat and surrounded by four walls which stretched up to the heavens and formed a curved lid. Scholarship has not been terribly kind to the work of Cosmas Indicopleustes. Even in his own time he had to staunchly defend his theory against strong criticism. By his own admission he was not well educated in the "learning of schools" and his unfortunate practice of distorting passages of scripture in order to support his argument led to his work being largely dismissed by his contemporaries and then disregarded by later generations. While we too can easily dismiss his eccentric notions which seem to be more the product of pious daydreaming than any kind of scientific investigation or empirical observation, on closer inspection there is another rather more interesting side to Cosmas. Thirty years before writing his book, Cosmas had led a life very different from the serene austerity of a desert cloister. Cosmas Indicopleustes actually means "Cosmas the India Voyager" and back then the monk was a merchant who had traveled extensively around the coasts of the Red Sea and the Indian Ocean. Buried deep under ten volumes of questionable scholarship which comprises the bulk of his Topology we find a surprising and particularly lucid account of his travels to these countries. This eleventh volume bears little relationship to the earlier parts of the book and it is thought to have been excerpted from another larger work of his on geography which has, sadly, been lost. While its known that the Roman world engaged in trade with the Indian subcontinent, Cosmas offers us one of the only authentic eyewitness accounts. A close reading indicates that he had considerable local knowledge of the regions he describes and there is little doubt that he actually visited these places rather than merely relating second-hand information. This animal is called the rhinoceros from having horns upon his snout. When he is walking his horns are mobile, but when he sees anything to move his rage, he erects them and they become so rigid that they are strong enough to tear up even trees by the root, those especially which come right before him. His eyes are placed low down near his jaws. He is altogether a fearful animal, and he is somehow hostile to the elephant. His feet and his skin, however, closely resemble those of the elephant. His skin, when dried, is four fingers thick, and this some people put, instead of iron, in the plough, and with it plough the land. The Ethiopians in their own dialect call the rhinoceros Arou, or Harisi, aspirating the alpha of the latter word, and adding risi. By the arou they designate the beast as such, and by arisi, ploughing, giving him this name from his shape about the nostrils, and also from the use to which his hide is turned. In Ethiopia I once saw a live rhinoceros while I was standing at a far distance, and I saw also the skin of a dead one stuffed with chaff, standing in the royal palace, and so I have been able to draw him accurately. The accuracy of Cosmas' drawing of the rhinoceros leaves a fair bit to be desired but apparently the word arou that he gives as the name of the two-horned rhinoceros is still used in Ethiopia to this day. Dog chow for brekky As I implied in an earlier post I have been working on software that will enable me to manage my own website. This software is part of a suite of products that we're developing at Lagado which covers things like content management and site maintenance and goes all the way through to publishing to web or print. So it's tad ironic that Laputan Logic has up to now been maintained using someone else's code. I'm not complaining about Blogger which I think has improved dramatically of late1 but I've been thinking it's high time that I start to practice what I preach or, to borrow some industry parlance, its time to start eating my own dog food. Update on the Third Buddha It now appears that Japanese archaeologists are also on the case to find the missing third Bamiyan Buddha. This looks like it's heating up to be a race to see who finds it first. My bet is that the only thing left to find will be its stone foundations. A team of Japanese experts departed Saturday afternoon for Afghanistan on a mission to search for an image of a supine Buddha in Bamiyan. The team will attempt to confirm the existence of the supine Buddha that is rumored to be located somewhere in the region by using high-tech devices such as radar capable of locating buried artifacts. Xuanzang (602-664), a Chinese Buddhist monk, described the artifact in his book "The Records of the Western Regions of the Great Tang Dynasty": "Inside a Buddhist temple located about 10 kilometers from the palace, there is a statue of Buddha in a state of passing into nirvana. 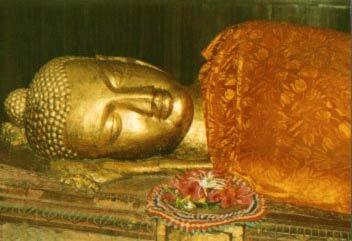 The image of the supine Buddha is as long as 300 meters." He also wrote in his book: "There is a stone image of a standing Buddha carved into the mountainside northeast of the palace. Shining in gold, and adorned with jewelry, the statue stands about 45 meters tall. To the east of the temple, stands another statue of a 30-meter-tall Buddha made with brass." The statues he described in the book are believed to be the two Buddha statues that were destroyed by Afghanistan's former Taliban rulers in March 2001. The research team considers that the description of the statues in Xuanzang's book is highly accurate, and the information concerning the existence of a supine Buddha is credible. 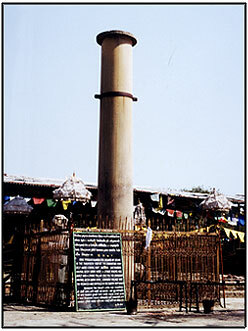 It is believed that the palace and the temple are buried underground. No fact-finding probes have been conducted of the area due to the country's protracted conflicts. The project to probe for the image of the supine Buddha was commissioned by Japan's National Research Institute for Cultural Properties. Eight researchers mainly from the institute will examine the area from Monday through Oct. 22. The research team will use a ground-penetrating radar to determine the location of buried items and hollows under the ground, allowing the team to determine the size of the entire archaeological site before excavating it. The radar emits electromagnetic waves into the ground using an antenna that can detect energy emitted from buried objects. Researchers will use the radar at about 50-meter intervals over a 1.3-kilometer area from east to west, as well as 300 meters north-south of the two destroyed statues. The image of the supine Buddha is believed to be located between the two statues. "I don't think the image of the supine is as big as Xuanzang described in his book. It will probably be about 30 meters long, not 300 meters as he described," said Kazuya Yamauchi, the team's chief researcher. Yamauchi said if the statue was as long as 300 meters, it should already have been discovered. "I'm worried about whether the radar can detect the statue underground if it's not that big," he said. The possibility that the image of the supine Buddha remains in the same condition as Xuanzang saw it in the 7th century is low, and it is highly probable that even if it is discovered, it will be damaged to some extent. "If we succeed in discovering traces of the site, it will definitely be the key to finding out more about the former Bamiyan kingdom," Yamauchi said. For quite a while now I have been running in the right hand column a list of the headings for the posts that appear on the page (see the "Heads Up" list). This I think is a convenient indicator for people to quickly see what has changed or to spot something they may have missed. Any way I like it and all the groovy MT blogs have a "recent posts" list a bit like this by default. Used to express excited approval. etymology: Spanish, perhaps from Arabic wa-llh, by God! (used as an expression of admiration) : wa-, and; see w in Appendix II + allh, God; see Allah. 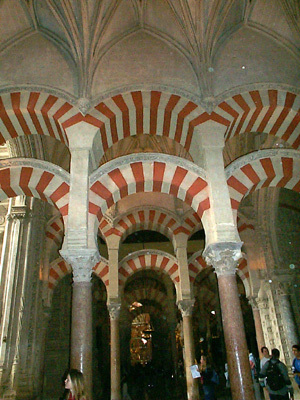 When I visited Spain a few years ago, the place that I loved the most of all was Cordoba. This is a city that apart from its relaxed atmosphere, its food and its flamenco exudes history from every corner and leaves you with the impression that it's built a bit like a layer-cake made up of different historical epochs, one on top of each other, each one just as remarkable and interesting as the next. The notion is best exemplified by the magnificent of architecture of the Mesquita, a beautiful former mosque that was once the largest of its kind in the world. 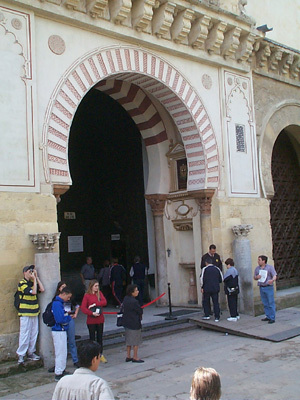 This building recalls a time when Cordoba was the capital of the Caliphate of Cordoba, a western arab emirate that had broken free from the rule of the Abbasid Caliphate based in Bagdad. Allah granted all but the last wish, reasoning that if all the others were given a proper government, al-Andalus might rival Paradise. 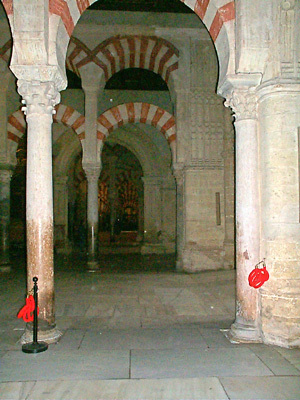 A little history is in order if you want to fully understand the amazing scope of the Mezquita. 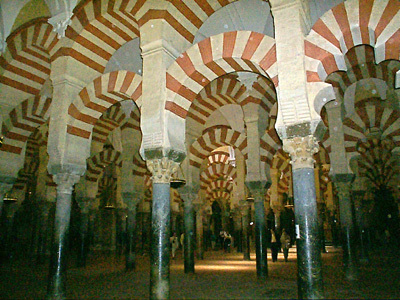 The original Mosque was built in 785-787, soon after the Moorish conquest of 711. Abd al Rahman I wanted his mosque built quickly, so they used recycled materials from the former Visigoth church and ancient roman temple formerly on the site - thus many of the more than 850 columns are of slightly different heights or materials, and they compensated by slightly burying them or raising them on pedestals to make the columns uniform. The columns support the amazing double arches, which dominate the inside of the mosque. The bottom arches connect the columns, while the top arches support the roof. The red-and-white color is a result of the building materials used - sandstone (white) and brick (red). The brick was used for two reasons - not only is it cheaper than stone, but it also allows for some give and movement in the case of earthquakes. 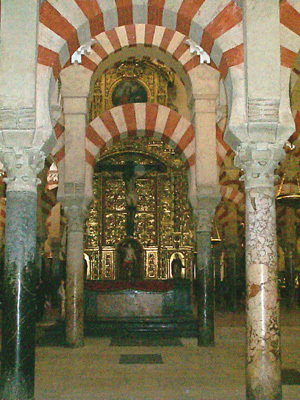 Later, the Mosque was expanded several times by Moorish leaders, each time to accommodate the growing Moslem population of Córdoba. The 10th Century expansion included the building of the Mihrab, the magnificent prayer niche whose sea-shell shape provided microphone-like acoustics. During that renovation, the powers-that-be wanted to show their wealth and power by making arches of pure sandstone, and just painting them with the brick pattern so they would match - a bad move, since this was the area of the mosque that was most damaged by earthquakes in later centuries. ...or really really trashy if you want my honest opinion. 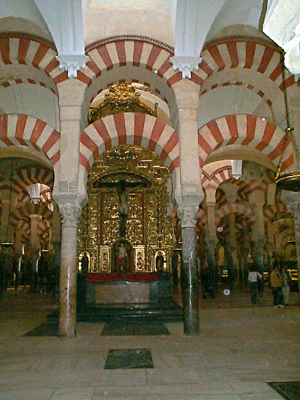 Charles himself had complained that the conversion of the Mesquita to a baroque cathedral had destroyed "something unique to build something commonplace.''. Oh well, just another layer to Cordoba's layer-cake, I suppose. That last remark is so true, the other theme of Cordoba (and of the former Roman provinces generally) is one of continuity. This point was really brought home to me when I visited the ancient city of Nimes in Southern France, home to the best preserved Roman coliseum in the world. 13th Century tablet could lead to lost archives of Ramses II The discovery of a stone tablet detailing diplomatic ties between the ancient Egyptians and Hittites in the 13th Century BC could be the key to the lost archives of Ramses II, according to archaeologists. Discovered at Qantir 120 kilometres north-east of Cairo, the tablet dates back to the time of the ancient Egyptian pharaoh, Ramses II (1298-1235 BC) and confirms his capital, Pi-Ramses, was in the Nile Delta. "Its the first time that such a written record has been found in the capital of Ramses II, which confirms the location of Pi-Ramses," Mohammad Abdul Aksud, director of antiquities in the Delta region told AFP. Although small and badly preserved, the tablet takes the form of an 11-line letter sent by the central Anatolian Hittite court to that of Ramses II, Mr Aksud said, which "could lead us to the lost archives of Ramses II". It was found by a team of German archaeologists, lead by Egyptologist Edgar Pusch, secretary-general of Egypt's Supreme Council for Antiquities, Zahi Hawass told AFP. It dates from shortly after the Egyptian and Hittite empires made peace in 1278 after years of war, Mr Hawass added. The tablet is written in cuneiform script, invented in about 3,300 BC by the Sumerians and used throughout the Middle East until the first century AD. Quoting Pusch, Hawass told AFP it was comparable to another tablet written in cuneiform found in Turkey and others found at Tell Al-Amarna, in southern Egypt. Tell Al-Amarna was capital during the time of Akhenaton (1372-1354 BC), remembered in history for having switched his kingdom to monotheism with the worship of the one sun god, Aton. The tablets found there show the earliest diplomatic correspondence ever discovered. The Qantir tablet may be followed by the discovery of a temple in the same region, where Ramses II built his capital. Dark Matter again First proposed as a way of explaining the curious rotational behaviour observed in spiral arm galaxies, the theory of Dark Matter has since gone on to become one of those essential building blocks of cosmological theories. But as an aether-like, invisible, undetectable, inexplicable substance that permeates everything and according to some may even make up 90% of the Universe, it seems like a bit of a Rigg's constant, a big fuzzy fudge factor that was invented to make theory fit facts rather than an actual quantity. I think it's fair to say that it indicates an incompleteness in our current understanding of the Universe. Perhaps this latest finding will help to stimulate the search for some more satisfying answers. Astrophysicists will be scratching their heads following the discovery that three elliptical galaxies seem to contain little or no dark matter. A team led by Aaron Romanowsky of the University of Nottingham in the UK found that the dynamics of the elliptical galaxies could be explained without the need for dark matter, in contrast to the motion of spiral galaxies. The unexpected result questions the widely held belief that elliptical galaxies form when galaxies rich in dark matter collide. Dark matter was originally proposed to explain why galaxies rotate as though they contain much more matter than astronomers can detect with telescopes. The existence of this invisible mass - and its gravitational pull on ordinary baryonic matter - has become a cornerstone of modern cosmology, but now Romanowsky and colleagues have cast doubt on its existence in certain galaxies. For three elliptical galaxies, the researchers measured how the rotational speed changed from the centre of the galaxy to its outer edge. To do this, they used the 4.2-metre Herschel telescope in La Palma to look for planetary nebulas - shells of gas ejected by sun-like stars at the end of their lives. The spectra emitted by these shells contain well-known absorption lines, which are red-shifted for nebulas receding from Earth and blue-shifted for those approaching us. The degree of this Doppler shift enabled the researchers to calculate the velocities of hundreds of nebulas, and therefore their galactic neighbourhoods. To their surprise, Romanowsky and colleagues found that the rotational speed of the galaxies fell towards their outer edges - a result that Johannes Kepler would have predicted long before the advent of dark matter. In contrast, the rotational speed of matter beyond the visible edge of spiral galaxies remains constant. Astronomers believe this arises from the gravitational effect of 'halos' of dark matter around spiral galaxies. Now they must explain why certain types of galaxy appear to be rich in dark matter while others seem to be deficient. Kinda nodded off there for a minute Apologies (and thanks) to those persistent souls who have been visiting this site during this extended period of hiatus. It's been nearly a whole month since my last post and really things have not been too flash around here for the best part of two month before that. Blogging has been extremely disrupted by a combination of factors like: "being really busy", "running out of steam a bit", "disruptions to the working environment". It started back in May when we rashly decided to put our house on the market only to pull it off again a week before auction. We haven't regretted either decision, it gave us an opportunity to spruce the joint up and in the process realise that we actually liked the place a lot more than the places we'd been looking at. The next thing that happened was a major work project which has been keeping me fully occupied, time to surf research has been severely curtailed of late. Any way, Spring has sprung finally (and thankfully, I've reached the "enough" stage when it comes to Winter) and the pace at work has slackened to a slightly less hectic pace and so I hope to be able to get things back into some kind of shape here at the LapLog over the next week or so. Stay tuned. This image was taken on a drab and overcast Winter's day so it was decided that the sky was to be photoshopped into something nicer for the sales brochure. An unexpected side-effect was that the two white chimneys on the roof became completely transparent, mere ghosts of their former selves. Athens - Diggers accidentally discovered a temple to Zeus at the foot of Mount Olympus in an indicating that ancient Greeks switched away from polytheism to the faith of a single God even before Christianity appeared in Greece, archaeologists said on Friday. The sanctuary was found during works to broaden the bed of the Vaphyras river running through the Dion temple complex at the foot of Mount Olympus, northern Greece - the seat of Greek mythology's twelve Gods. The findings include the sanctuary's foundations, 14 marble blocks with marble eagles engraved on them - Zeus's symbol - and a slightly smaller-than-life-size, headless marble statue of Zeus, said archaeologist Dimitris Pantermalis who supervises the Dion site. The sanctuary dates to the centuries preceding Christ's birth. Insignia found on it refer to Zeus as "the highest". "It is a special version of Zeus as a single God residing in heaven... we know that 'Zeus the Highest' played an important role in the transition to monotheism," Pantermalis said. "The findings are dated before the birth of Christ, that's what's important," he added. It is the first time that a sanctuary to 'Zeus the Highest' is found, Pantermalis said.